If you're having a hard time finding the perfect fitness app, you just found it! 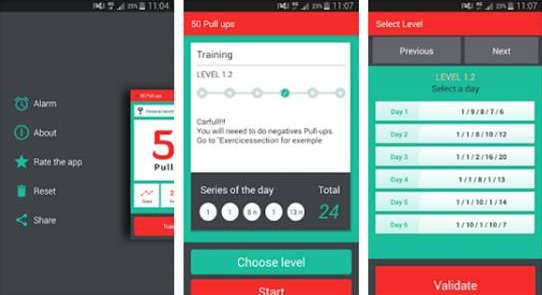 50 Pullups Workout is an app that helps you train your muscles. With this app you are going to discover different pull ups and we will guide you every day until you complete the 50 pull ups in a row. You will be able to follow your number of pull ups to help you complete your goal. This is the best fitness app that you can choose because it has different pull up exercises, we have the best routines that can help you lose the amount of weight you wish as fast as you can. You can find all the exercises followed by a video that helps you remember how to do them. All of our exercises are prepared by professional fitness trainers and they are explained step by step. You can reach your goal with our app very easily by just selecting the level you want to start with. This app is totally free and it doesn't require any special memberships. You are going to need to schedule your pull ups because it is the most important thing to do when trying to lose weight. So what are you waiting for? Download the best weight loss program app and get on the way to reach your goal as soon as possible! It is free on Google Play.